Talk about a trip of a lifetime and the place dreams are made, then you've just described our honeymoon to Tahiti and her islands. My husband and I travel frequently. We have been everywhere from the jungles of Costa Rica to the metropolis of New York City to the islands of the Caribbean and the ancient cities in Europe. But our favorite vacations always seem to revolve around laying on a beach somewhere. For our honeymoon, we wanted to go somewhere new, exotic and, of course, with beautiful beaches. Tahiti seemed like to perfect location . . . and it was! After picking the perfect location, we needed to plan the perfect trip. 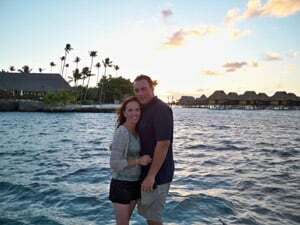 After running across a travel agent at a bridal show that specialized in travel to Tahiti and the South Pacific, we decided to give him a call. Kleon Howe of The Art of Travel (www.theartoftravelonline.com), out of San Diego, was excellent. We met with him to discuss our interests, are ideas of what a Tahitian honeymoon should entail, our budget and our desired trip length. With that information, he put together a suggested itinerary where we would stay for 14 days and visit 3 different islands. Kleon suggested that the islands we visited and the type of accommodations should get better as the trip went on so that we weren't disappointed. 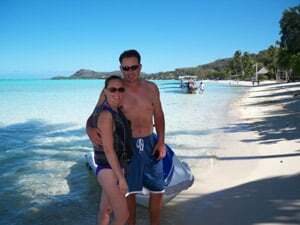 He suggested that we start our trip in a garden bungalow in Moorea, then go to a beach bungalow in Huahine and finish our trip in an overwater bungalow in Bora Bora. That is exactly what we did. Once the location was decided, we were able to utilize the services provided by Traveler's Joy to add activities to our itinerary. While in Tahiti we wanted to eat at wonderful restaurants, explore the islands, go out on the water and relax at the spas. So, through Traveler's Joy we created a list of activities such as: dinners and lunches at various restaurants recommended by our travel agent, jet ski tours, lagoon boat tours, snorkeling excursions, shark feeding trips, sunset sailboat rides, massages, and much more. Our honeymoon registry was so popular with our wedding guests that we got basically everything we asked for and then had to figure out how to fit it all in. In the end, we received almost $4,000 toward honeymoon activities. It really made our honeymoon the dream vacation we wanted it to be. With our flights booked, hotels reserved and activities planned, we couldn't wait to begin our exploration of Tahiti and her islands. Our wedding was in San Diego, California on August 2, 2008. We left for our honeymoon from San Diego on August 4 and returned on August 18. Our travel agent booked us a direct flight from Los Angeles to Papeete, Tahiti on Air Tahiti Nui. We left LA at about 11:30 p.m. and arrived in Papeete at about 5 a.m. From there we took a 30 minute ferry over to Moorea, where we were shuttled to our first hotel. We couldn't believe our eyes on how blue the water was on our drive to the hotel. The island was very green and the water was the most beautiful shade of turquoise. It was like nothing we had ever seen before. Those magazine pictures really don't do it justice. After a very scenic 45 minute drive, we finally arrived at our hotel - The Intercontinental Resort and Spa Moore (www.moorea.intercontinental.com) - and checked in to a spacious garden bungalow which had champagne chilled and a decoration of flowers waiting for us. - Swam with dolphins at the Intercontinental Dolphin Center; - Tiki Village Dinner and Dance Show, an authentic Tahitian feast and dance show; - Enjoyed a couples massage and body scrub at the outdoor Helene Spa at the Intercontinental; - Sunset sailboat ride to Cook's Bay complete with Mai Tai's; - Romantic dinner at the Te Honu Iti Restaurant overlooking Cook's Bay, with stingrays swimming and feeding just off the back balcony. As very big Parrotheads (yes, Jimmy Buffett fans), it was phenomenal to sit on the shores of Cook's Bay and understand exactly why he wrote the song One Particular Harbor. Jimmy was inspired by the views on this island and wrote my favorite song there. After being there it was clear to me what inspired him to write that song and why I loved it so much. Our favorite activity on Moorea was the dolphin swim. We were able to get in the pool with the dolphin, pet it, feed it, pose for pictures with it and even give it a kiss. Although the kiss was nothing to write home about, it was a very educational and enjoyable experience. The Helene Spa was also very relaxing and enjoyable. It is an outdoor facility with a wide variety of spa services. The service and treatments available rival some of the famous 5 star Napa Valley spas in California. I started with a 30 minute coconut scrub that left my skin soft and smooth. My husband then joined me for a 30 minute couples rain shower massage. Our treatment ended with a 50 minute couples Swedish massage. It was all heavenly. After our four days in Moorea, we caught a quick flight to Huahine. We were transferred by boat to the Te Tiare Beach Resort (www.tetiarebeachresort.com) to begin our 3 night stay in an enormous beach bungalow. The only access to this 41 unit resort was by boat. Huahine is a spectacular island. If was possible, the blue water we saw in Huahine was even more exquisite than in Moorea. This island was the place of dreams, a place where you can leave the modern world behind and give yourself over to the joys of living. This island was far less populated than Moorea and didn't appear that many tourists had yet discovered it. We were truly in a tropical paradise. The lagoon tour of Huahine was one of the best experiences we had in Tahiti. It was a full day tour where the boat picked us up right at our hotel. After viewing the scenic waters of Huahine by boat, we stopped to snorkel in the middle of the lagoon. The fish were colorful and plentiful. But, the most memorable part of the trip was the shark feeding. We got right in the water, not in a cage, and the black fin reef sharks were within feet of us. Even thought the tour guide was the one actually feeding these amazing creatures, they did give us an opportunity to feed some marine life. After the sharks had devoured all of the food intended for them and swam away, we pulled out some loaves of bread and swarms and swarms of butterfly fish began feeding on the bread right out of our hands. There must have been thousands of these colorful fish trying to nibble on the bread. It was amazing. Huahine was beautiful and is a place we will definitely return to. It is a place of pure happiness and relaxation. We then flew to Bora Bora where we were greeted by a yacht and taken to the Bora Bora Lagoon Resort and Spa (www.boraboralagoon.com) for 5 nights in an overwater bungalow. The entire resort was built on a motu and only accessible by boat. With the lush and tropical Mount Otemanu as the focal point of the island leading to the white sand beaches and the blue waters, Bora Bora is synonymous with paradise. Our overwater bungalow had a direct view of Mount Otemanu, a back patio with steps leading directly into the lagoon and a glass coffee table where you could remove the top and feed the fish below. We were the most popular bungalow on the block with the fish because we fed them constantly. This was right out of a travel magazine. We explored Bora Bora via jet ski. In a half a day we were able to jet ski around the entire island in its crystal blue lagoon. At this point of our honeymoon, we didn't really want to fill our days with a lot of activities, so the only other activity we did, again with the help of our honeymoon registry, was to take an ATV tour of a motu, including a lunch where our tour guide climbed a 30 foot palm tree to get us fresh coconut and fried bananas on palm fronds on the beach. Boy did we eat well in Bora Bora. A great, fun restaurant is Bloody Mary's. Out in front of the restaurant is a list of famous people that have eaten there. We located some of our favorites (e.g., Jimmy Buffett, John Elway, etc.) and posed for pictures next to their names. The restaurant has a sand floor and tables made out of palm trees. When you go into the restaurant, the fresh fish is displayed on ice and the restaurant host describes exactly what's available for you to order and enjoy that evening. The ahi was the perfect shade of red and I enjoyed it merely seared. My husband enjoyed the mahi-mahi and commented many times on how fresh it was. We enjoyed Bloody Mary's restaurant so much that we went back a second time for lunch. For lunch they serve from a menu, which includes a Jimmy Buffet Cheeseburger in Paradise - the perfect meal for us Parrotheads. 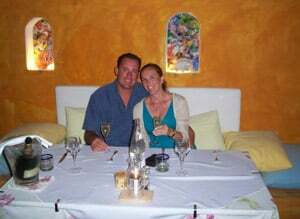 On our final night in paradise, we ate at La Villa Mahana (www.villamahana.com). Although this was one of the most expensive meals we have ever had, it was also one of the best. Chef Damien personally escorted us to the best seat in the house. This Mediterranean style villa only has 6 tables indoors, with one special table outside on the patio with a view overlooking the water and the courtyard below. We were lucky enough to get the special outside table because our travel agent, Kleon, booked our reservation well in advance. The rumor is, this place is harder to get into than the French Laundry. The meal was amazing, the seafood fresh and the meat tender. Including wine, we spent around $600, but it was well worth it, not just for the food, but for the perfect ambiance to celebrate the last night of our dream vacation. The total cost of our airfare and hotel accommodations was about $12,500 for 14 days, including all air and ground transfers. We spent an additional $6,000 on food and activities, over half of which was paid for through our Traveler's Joy honeymoon registry. Our dream vacation came to an end, but the memories will last forever.